Location: Between the A4086 Llanberis bypass and High Street at the south-eastern end of the village. Present state: Station building extant in use as a craft centre and cafe. Notes: Llanberis station was the eastern terminus of the Carnarvon & Llanberis Railway (C&LR) which was authorised on 14 July 1864. The line initially ran from Carnarvon Morfa to Llanberis and was 9 miles in length. Although the first sod was cut on 15 September 1864 progress was slow as the C&LR struggled financially from the start. During the 1866 financial crisis work on the line stopped completely. The London & North Western Railway (LNWR) offered to buy and complete the line using the threat of an alternative Bill as leverage. A compromise was reached, the LNWR gaining 4½ miles of the line at the Llanberis end and running powers over the rest. Work began again, and on 13 December 1866 there was agreement that the line should be jointly C&LR and LNWR. The branch opened for both goods and passenger services on 1 July 1869. The station at Llanberis was located on the south side of the village and on the western shore of Llyn (Lake) Padarn. Access to the station was via a driveway from High Street. The station building was on the south-west side of the line on the single platform. It was a lofty single-storey twin pavilion brick structure with a generous hipped awning, clad in slate, and supported by four columns with elaborate brackets. To the north of the station there was a goods yard and shed. There was also an engine shed with turntable at which a Carnarvon Locomotive shed engine was out-stationed for working trains on the branch. The station opened when passenger services began on 1 July 1869. 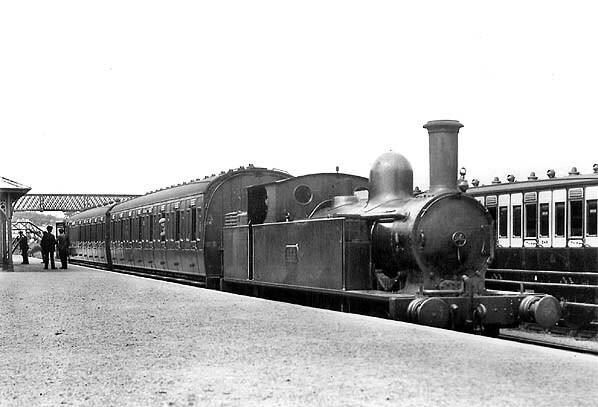 Trains were operated by the LNWR and ran between Llanberis and a temporary station at Carnarvon Morfa. On 4 July 1870 the line was vested completely with the LNWR. From January 1871 the passenger trains ran to Carnarvon station via the Carnarvon Town Line which had opened to goods services in August 1870. Most trains were operated by Llanberis-based crews. By December 1895 Llanberis had four departures and four arrivals on weekdays as shown in the table below. Llanberis lies at the foot of Snowdon, the highest mountain in Wales. On 9 April 1897 the Snowdon Mountain Railway (SMR), opened from Llanberis to the summit of the mountain: it had actually opened on 6 April 1896 but there was an accident on the first day. The Llanberis SMR station was only a short distance from the LNWR station. The SMR was a major tourist attraction, and excursion trains ran to Llanberis from a number of destinations. Due to the upsurge in traffic the LNWR built a narrow timber ticket platform to the south of the station. Excursion trains paused at the platform so that tickets could be checked. The engine shed at Llanberis closed after July 1915, and the staff were moved to Carnarvon. each direction. On 1 January 1923 Llanberis became part of the London Midland & Scottish Railway (LMS). The July 1925 timetable showed ten departures and arrivals on Monday-to-Friday with extra workings on Saturdays, as shown in the table below. It was during the 1920s that competition from local bus services had a noticeable detrimental effect on receipts for the Llanberis branch. Although the 1929 level of service was equal to that of 1925 on 22 September 1930 the LMS withdrew the passenger service as it could not compete with local buses that took passengers into the centre of Caernarfon (the railway station being on the northern edge of the town). Excursion trains continued to run to Llanberis, and in the summer of 1932 there were six trains to and from Caernarvon on weekdays. Excursions also ran from Llanberis to destinations such as Llandudno, Rhyl and Liverpool. Once a year a train was run to Belle Vue in Manchester for the ‘Crowning of the Railway Queen’ event. Consisting of four coaches, it set off early in the morning and did not get back until the early hours of the following day. During the 1930s the LMS placed a camping coach at Llanberis which could be booked for a week at a time; it was positioned in a siding opposite the station building. On 29 December 1934 the LMS introduced a market day passenger service between Llanberis and Caernarfon. 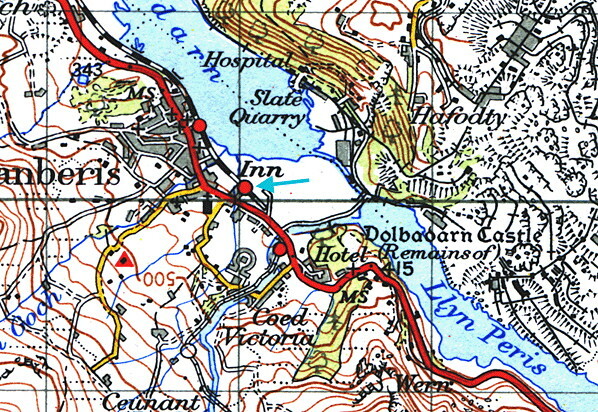 To make it more convenient for passengers they opened a halt a short distance to the south of Llanberis close to the centre of the village on 21 November 1936. The service then ran to and from the halt and did not serve Llanberis station. With the outbreak of the Second World War the market day service ceased as did all excursions. Excursions to Llanberis resumed in 1946, operating from Llandudno Junction, but the market day train was not reintroduced. On 1 January 1948 Llanberis became part of the British Railways (London Midland Region). During the summer months trains with the reporting number W635 ran from Rhyl to Llanberis on summer Saturdays; the train even had an observation coach at the rear. It was taken to Caernarvon for turning and then returned to Llanberis where it was attached to the rear of the train. In the second half of the 1950s the train even gained named status running as ‘The Snowdonian’. Even in the early 1960s passengers could still travel to Llanberis during the summer months. In August 1961 British Railways introduced a Llandudno – Llanberis Sundays-only DMU service, but it was poorly promoted and lasted for only three weeks. The unusual lingering death of the Llanberis line passenger service was mirrored in British Railways’ inconsistency in representing it on its passenger timetable maps. Despite the suspension of regular services in 1930, until winter 1960/1 the branch continued to be shown on the national network map. On the reverse of this map in the LMR timetable book the LMR network was shown, including the Llanberis branch coloured maroon as if a passenger line but with goods-only stations, until winter 1959/60. In the summer 1960 edition goods lines and stations ceased to be shown on the LMR map, so the Llanberis line disappeared – while still appearing as a passenger line on the national map on the reverse. The last Monday-to-Friday summer excursion trains ran on 7 September 1962. Since 1957 Llanberis had been served by only one goods service every other day. By 1963 it often contained only one or two wagons. British Railways decided to close the Llanberis branch and the last goods train departed for Caernarfon on 7 September 1964. The task of lifting the Llanberis branch tracks was carried out by trains from January 1965; the work was complete by the following April. The station at Llanberis survived although the trackbed became a bypass road. In 2012 the station was in use as a heritage centre, bookshop and café. 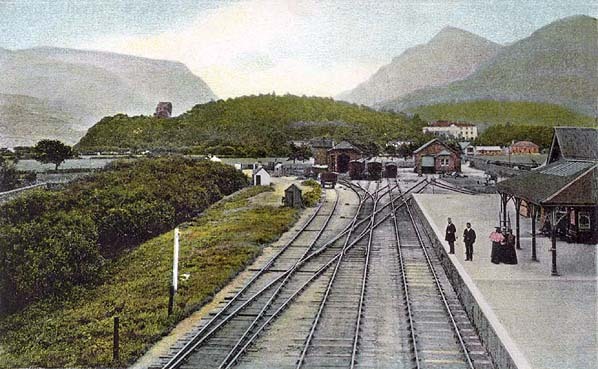 Llanberis station looking south-east in 1903. The passenger station is seen to the right and in the distance the goods yard. The goods shed is to the right with a green door and the engine shed to the left. Beyond the goods shed to the right can be seen Llanberis Snowdon Mountain Railway station. 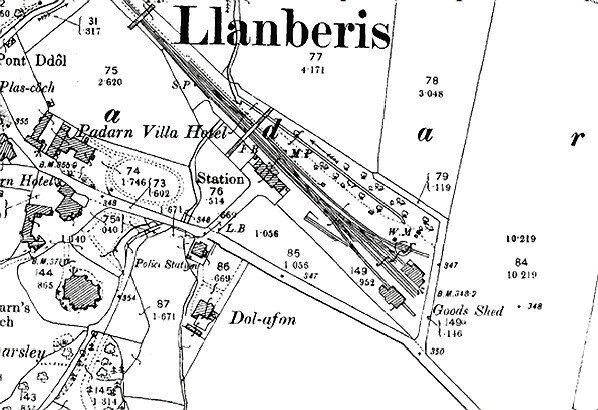 Llanberis station shown on a 1900 map. A busy day at Llanberis in the summer of 1912. The length of the train would indicate that it was an excursion that had probably come from one of the North Wales coastal resorts. 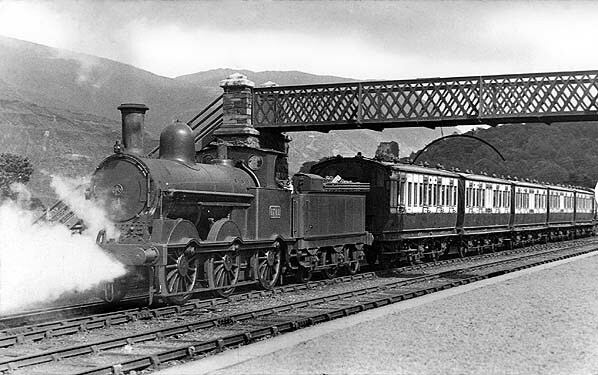 An excursion train stands in the sidings at Llanberis station in 1920. the footbridge provided access between the village and Llyn Padarn. A local service for Caernarvon prepares to depart from Llanberis in 1926. The train was equipped to operate in push and pull mode. The locomotive would push the train to Caernarvon. The driver sat in a cab in the leading coach and communicated with the fireman in the locomotive via pulleys and bells. Llanberis station looking north-west in 1948 during a quiet period. 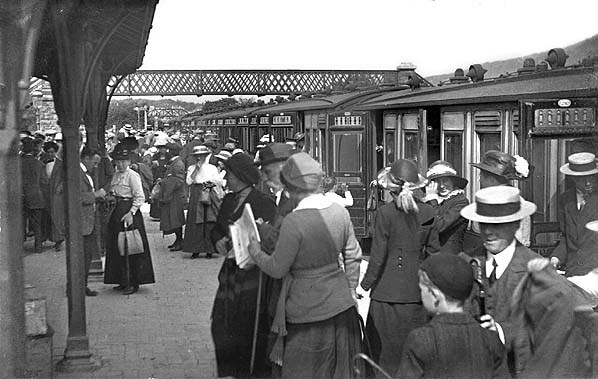 The station had no regular passenger service at this time but it was used by excursions throughout the summer months. 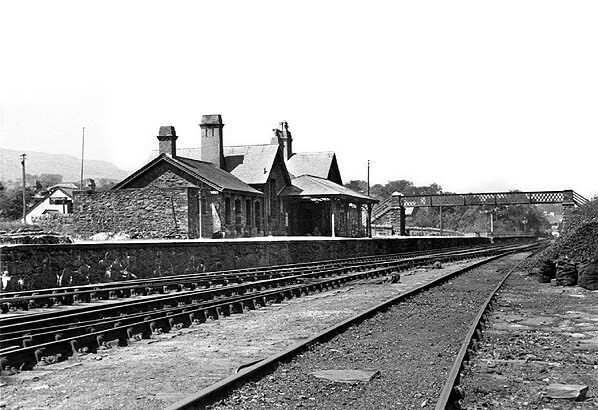 Looking north-west at Llanberis station in 1953. Standing at the platform is an excursion from Rhyl. 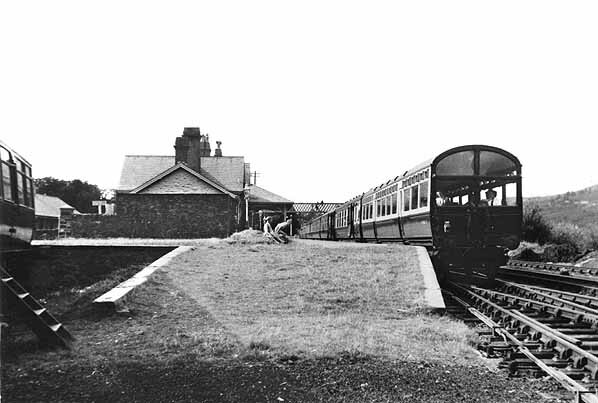 This was a regular summer service and it was provided with an observation coach which was coupled to the rear of the train. This view shows the train nwaiting to return to Rhyl. When the train arrived earlier in the day the coach was taken off the rear and taken to Caernarfon where it was turned. It was then brought back to Llanberis and attached to what had become the rear of the train. 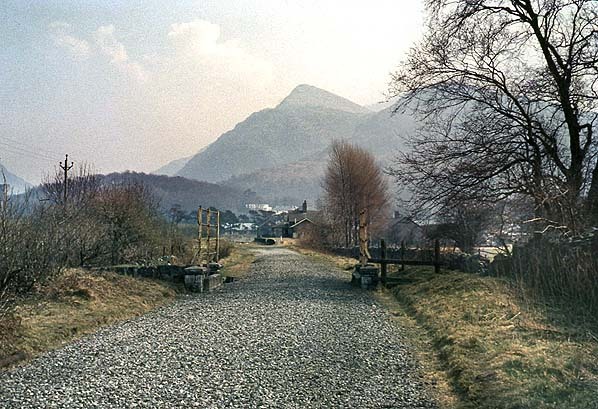 Looking south-east towards Llanberis in the second half of the 1960s. the station can be seen in the distance. In 1973 a bypass road was built along the course of the railway. 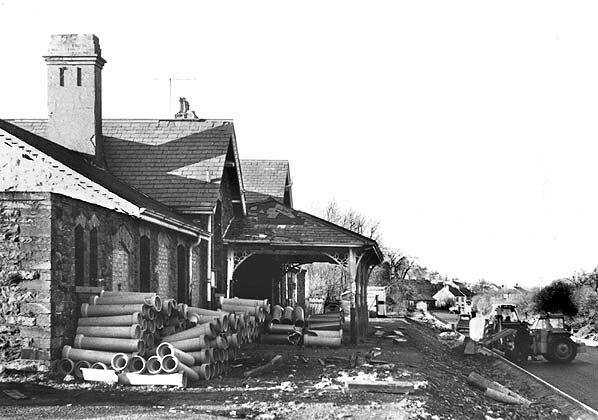 Llanberis station in December 1972 during the construction of the Llanberis bypass. The platform was being used to store materials by the road building contractor. Looking north-west at Llanberis station on 25 May 2012. the station had survived closure and was in use as a cafe and heritage centre. The road seen to the right occupies the trackbed. Llanberis station seen from High Street on 25 May 2012.